- an integral part of the Barnyard Experience! All Barnyard Theatres have a fully stocked bar, coffee & snack bar and in-house food options that have become synonymous with the Barnyard Experience. Food options include pizzas, gourmet platters, snack baskets and buffets at participating Barnyard Theatres. The Barnyard Theatres are self-service establishments. For your convenience you can pre-order food & selected beverages prior to the show or order at the food/bar counter when you arrive. Order In-theatre - allow up to 45 minutes for preparation. Buffet orders must be placed 72 hours in advance. The buffet is available to a minimum of 50 guests. Contact your preferred Barnyard for options. Images are for illustrative purposes only and items may vary between different Barnyard Theatres. Food & drinks prices and menu items are subject to change without notice. Wines, Beers, Ciders, Cocktails, Shooters, Non-alcoholic Beverages, Coffee, Tea, Milkshakes, Savoury & Sweet Snacks & more. No own drinks are permitted at any Barnyard Theatre. Craft beer on tap and wholesome gourmet food freshly prepared daily. 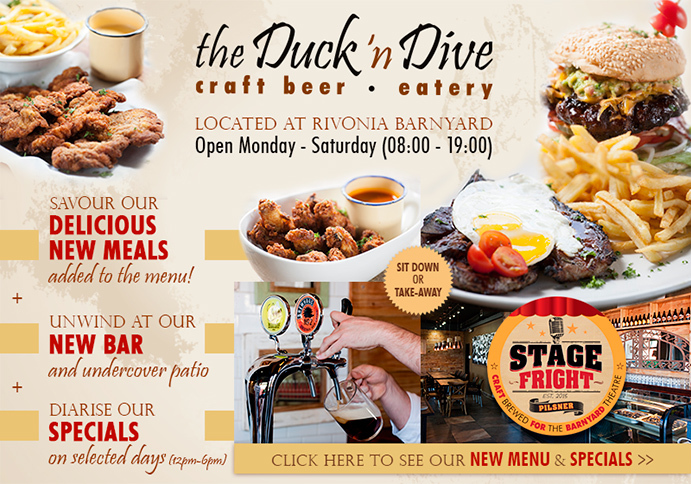 The Duck ‘n Dive eatery at Rivonia Barnyard is ideal for pre-work coffee or breakfast, a laid-back craft beer tasting session lunch breaks, business meetings & more! We also have a private upstairs section that can be hired out for private meetings or parties. You can pre-order your food & drinks when booking your Barnyard tickets online or when you phone in to book. You can Pre-order via online bookings on our website when booking your show tickets or you can inform the booking consultant that you would like to add Pre-orders to your booking if you prefer to phone in to book your show tickets. Platter pre-orders must be placed at least 48 hours or more prior to the show starting time. There is no surcharge or additional levy added to any food or beverage items when you opt to Pre-order - it’s a free, value added service to our customers. If you book your show tickets online and you then decide to place a Pre-order closer to the time you can phone in to the relevant theatre and ask the booking consultant to add pre-orders to your booking. Food & drinks prices and menu items are subject to change without notice. While every effort is made to illustrate our food as accurately as possible, images are for illustrative purposes only and items may vary between different Barnyard Theatres. Platters are served at room temperature.